Atelier Rorona Plus is a remake of the original Atelier Rorona game that was released by NIS on Playstation 3. The game is a combination RPG-meets-crafting sim, where your main character uses alchemy to craft various items for use in-game. If you have never played Rorona before, this version is the better of the two, as they have adjusted the game to be slightly more like Atelier Meruru and Atelier Totori, games that were Playstation 3 releases after the original Atelier Rorona. If you have played Rorona before, there’s little need to play this version, as the main core game play hasn’t changed significantly between the two versions. 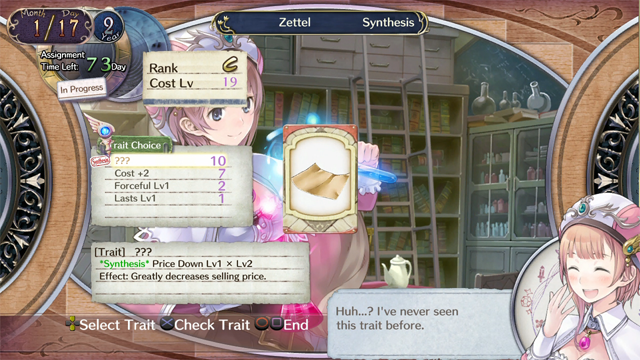 Atelier games from recent times all have very similar game mechanics. The game is timed, with a period of three in-game years that the story progresses through. Each period is separated into three “assignments,” specific things that advance the plot and guide the player through the tasks of exploring, gathering, or crafting. These assignments get more difficult and complex the further through the game a player goes, but overall each fall into one of those three categories. Most tasks in town can be navigated by menus, from turning in assignments to traveling to different shops. There is a great deal of extraneous content, conversations with characters, hidden scenes, extra gathered materials, and even bonus assignments that can be explored and completed while in town. To be honest, I found the additional scenes relatively uninteresting, and in many cases not worth bothering to earn since the rewards were so limited. One of the main mechanics from the original Rorona that was carried over involves the construction of your party. In the original game, you hired other people on a per-trip basis to fill out your party. There was always Cory, who was the only character not to charge a fee, but for the most part it would often be too expensive to hire the other characters. This, unfortunately, hasn’t changed. You now have extra characters to hire, however, that weren’t playable in the original game. Astrid, who charges almost 10,000 per trip (and isn’t really worth it), and Esty, who is slightly less expensive to hire than Sterk, but is extremely useful. The fact that you have to pay your party is probably one of the biggest flaws of the game, since money isn’t exactly easy to come by. Some of the things added to this version are interesting and useful. You can now “decorate” your workshop with all kinds of useful items. There are ones that provide materials, ones that increase the effectiveness of your crafting, the quality of ingredients you find, how often you find them, how much money you get from battle, and a host of other things. You can also grow materials in a garden outside your shop, though I've found that seeds are incredibly rare. There’s also a dressing room, where if you have save files on your system from other games you can get extra costumes to dress your characters in. This doesn't affect game play at all, but is a nice little cosmetic addition. If you've ever played an Atelier game before, the game play is nothing surprising. 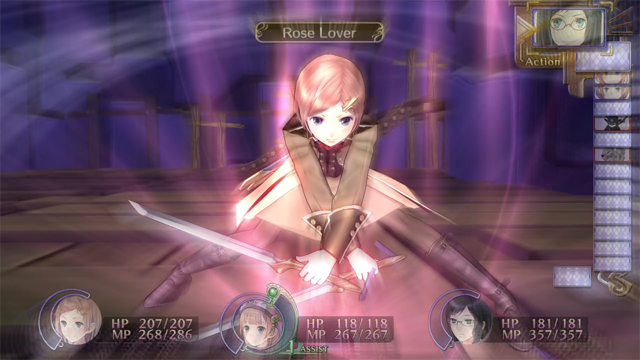 Battles are turn-based, and Rorona has an assist meter that allows other party members to either protect her from damage or aid her in attacks if she uses a skill. Crafting requires MP as well as ingredients and time, so more often than not you’re better off saving your MP for what you’re trying to make instead of using it to throw skills around. Normal enemies are evenly balanced, but rare and target monsters seem to be overpowered for the equipment and items available whenever the player first encounters them. Dungeons require time to get to, and that time is rarely anywhere close to what it looks like it should take based on the layout of the map. New areas become available slowly at first, and then very quickly once you get further into the game, something which is a bit of a pain. Often, you’ll need materials from the place you’re in to finish off exploring the place you were. Still, the bonus assignments are a nice addition, as well as the rewards for completing them. Now, whenever you complete a bonus assignment, you get a stamp on a 3x3 grid, and each line you make earns you a different reward. You don’t have to complete the grid to ace the main assignment, but it’s a nice extra feature to make the game just a tiny bit easier. Unlike the original, too, the game seems to be a bit buggy and unpolished, which is odd to say for a remake. There were numerous times it would hang up while loading a battle, experience scrolling would be fast or slow depending on the amount being given, and at the end of battle it would take several seconds and numerous pushes of the x-button to go back to the normal screen. Often I would be just starting to worry about whether or not the game had frozen before it finally decided to continue. And battles aren't the only time that’s happened. Numerous times when loading a cut scene I would get the impression the game had frozen, and once I even had it crash on me completely while I was crafting. It was so bad that I had to reset the whole thing and load all over again. One other problem was in the help files, where I stumbled across grammatical errors on more than one occasion. Improper punctuation and incorrect words (i.e. “fine” instead of “find”) are more of a pet peeve than game-breaking, but still subtract from the overall impression of the game. The story hasn't changed at all from the original game. Rorona is a struggling apprentice trying to repay her family’s debt to the town’s lazy Master Alchemist, Astrid. It begins with Rorona being informed the workshop has three years to prove its worth to the town and the King, or it will be destroyed in favor of factories. Astrid, being the lazy lump she is, dumps responsibility for saving the workshop squarely on Rorona’s shoulders before heading off for her scheduled afternoon nap. With the help of her spoiled, rich best friend Cordelia, the town chef Iksel, burly knight Sterk, performing puppeteer Lionela, mysterious elder swordsman Gio, flakey bard Tantris, and now ninja/knight Esty and of course the eminently forgettable lazy alchemist Astrid, Rorona must save her workshop and her job. Oh, and maybe the town, too. Overall, this game is good, but problematic. There are a lot of issues that could easily have been resolved with a little careful attention (no excuse for bad grammar in this day and age) and some time. Not enough of the problems from the original game have been mitigated by the additional content. The story isn't as interesting the second time around, and the laggy game play is just annoying enough to push it down to the lower end of good. If you have never played Rorona before, you can flip a coin to decide which, but if you’re looking for a good Atelier game I would definitely say Atelier Escha and Logy is better.